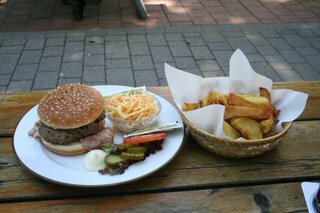 Der Burger Meister visited The Fox & Hound for what he considers one of the best burgers in Frankfurt ... but in the name of journalistic integrity, he is still looking far and wide. Check it out. Your comments or suggestions are always welcome, as I'm sure we are all on the hunt for a good burger once in a while. He never eats burgers now either..
yum mike, that looks incredible. We are making a salad for dinner and well now I want that instead!